BDP allows you to upload jpeg images and PDF floor plans and brochures directly into a property record from the Dropbox cloud, bypassing the need to upload from your local machine. This saves the upstream bandwidth issues often seen when one or more staff members are uploading large image files to BDP. NOTE: This is on an individual user basis, NOT a firm-wide basis. i.e. each user will need to follow these steps and connect their own unique Dropbox account from where they will have access to all shared folders. You will see a new Dropbox icon in the images widget. Click the icon to connect your Dropbox account to BDP. This is an authorisation procedure whereby you grant BDP the right to access your Dropbox account. Follow the steps shown. Clicking the link in step 1 opens a new tab or browser window and loads the Dropbox website. Click to Allow BDP to access your Dropbox files. 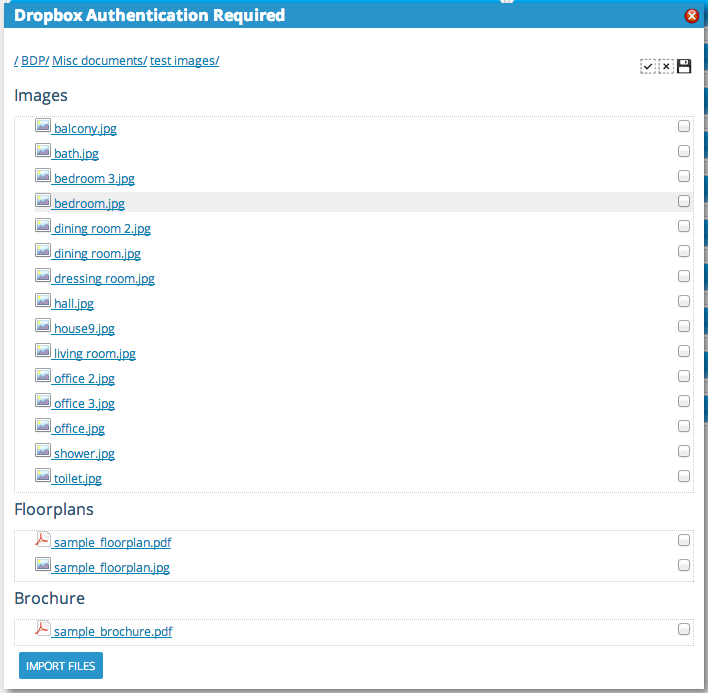 NOTE: If you are not logged in to Dropbox you will be asked to log in before you can complete the step above. You are then shown an API key which you must copy (highlight and press Ctrl + C (Windows) or Cmd + C (Mac)) then return to the BDP screen and paste into the box in Step 4 (Ctrl + V (Windows) or Cmd + V (Mac)) – See Fig. above. BDP is now connected to Dropbox. Once Dropbox is connected BDP is authorised to access your account until permission is revoked. See later in this document about how to revoke permission. In any property record in BDP, open the Photos widget and click the Dropbox icon. You see a file browser which loads a list of all the folders in your Dropbox account, including shared folders (folders you have shared with others and which others have shared with you). Clicking a folder enters that folder and displays the sub-folders and files within it. Click through to the folder that contains the media you are interested in. TIP: If your media is always stored in the same folder, or in a sub-folder of a “main” media folder, you can tell BDP that this is the default folder. When you have navigated to the folder, click the Save icon to the top right of the file/sub-folder list. Once you see the list of photos relating to the property you are editing, tick the ones you are interested in retrieving. You can select and deselect all using the tick and cross icons at the top right of the file list. NOTE: This panel allows you to retrieve PDF floor plans and brochures at the same time as images. If there are PDF’s in the listing that you require, click and drag into the relevant box and tick to retrieve – see figure 6 above. Similarly a JPEG floor plan should be dragged into the Floorplans box. Once the import has finished you will receive an email listing all files successfully uploaded and any failures. Images can be re-ordered or deleted in the BDP images widget as usual. If at any time you wish to revoke authority for BDP to access Dropbox, you must log in to Dropbox at dropbox.com. Click on your username in the top right of the screen. Scroll down to the Apps Linked section. Locate the BDP app in the list and click the X to the right. This disconnects Dropbox from BDP and means that next time you click the Dropbox icon in the images widget, you will have to follow the authorisation procedure once again.